Happy Independence Day! I hope everyone is enjoying a wonderful holiday with family and friends. 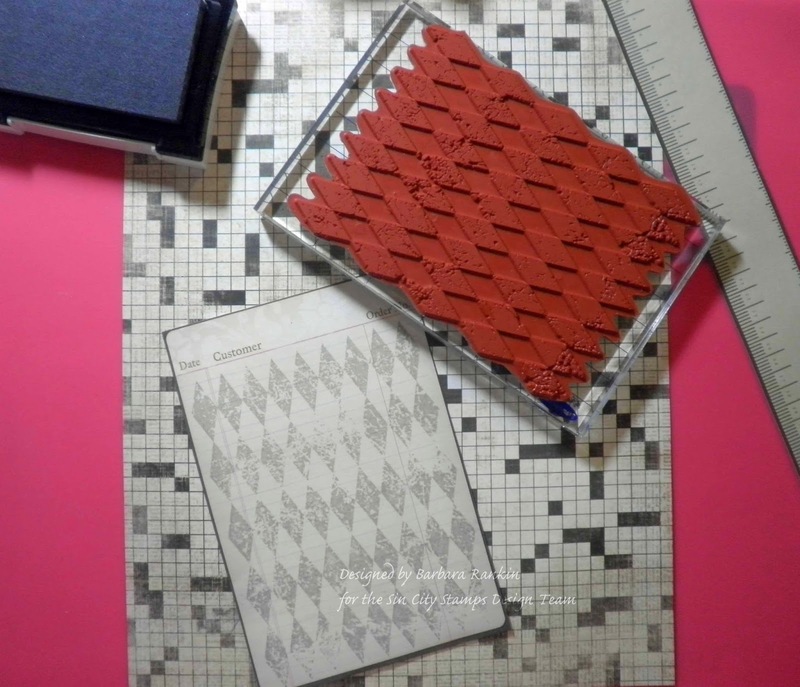 I am so excited to get to play with my new Sin City Stamps collections. I love making cards, and my father's birthday is coming up. 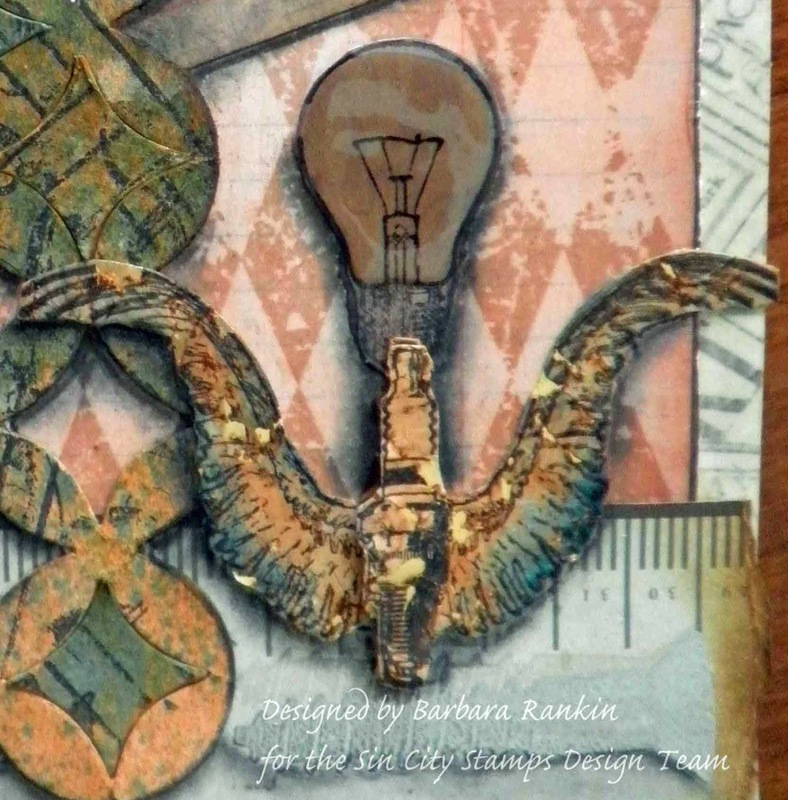 I thought the Classic Spark stamp plate images would work beautifully for a masculine card, as well as my "go to" Art Journaling with Terri Sproul stamp sets. 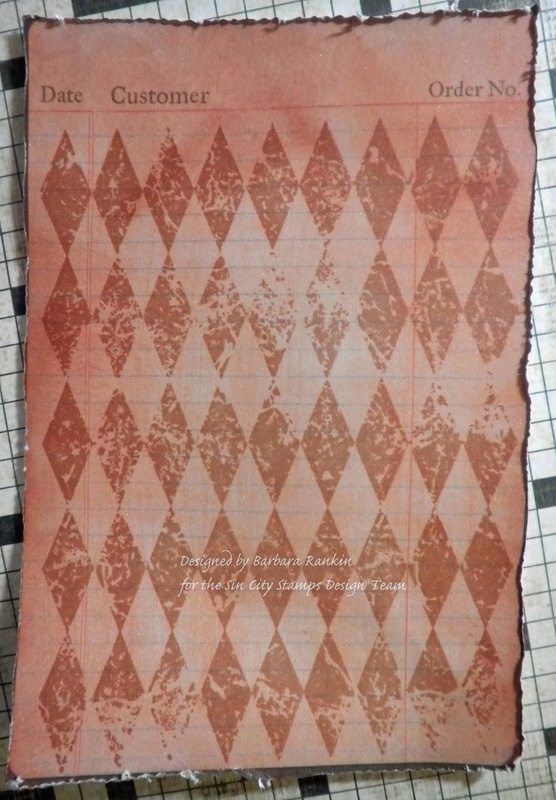 Cut newsprint card stock to 6-1/2" x 9", fold in half to make 4-1/2" x 6-1/2" card. 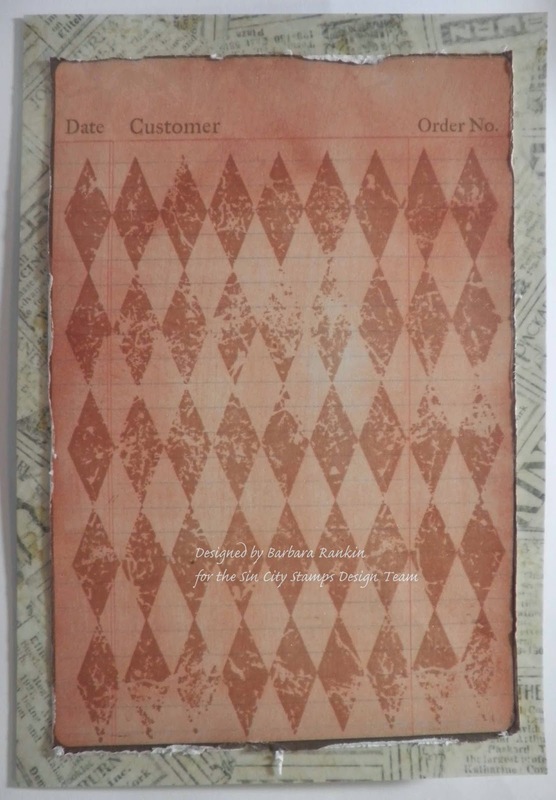 Stamp harlequin background with Slate Grey over pre-printed invoice paper. 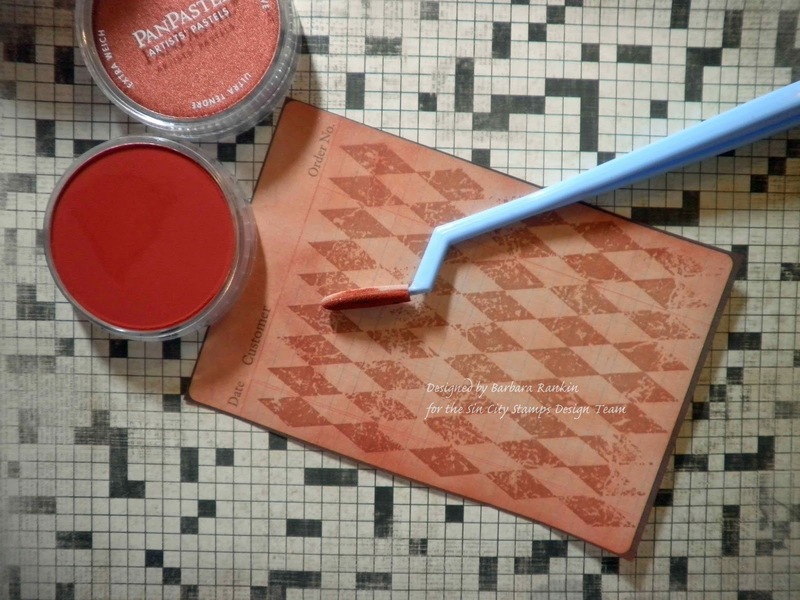 Use a Softt sponge to add Pan Pastels to entire stamped sheet. Interesting how the stamped harlequins picked up the color of the Pan Pastels to become a new color. Heavily distress edges and ink with Brushed Corduroy ink. Adhere this to center of card front. 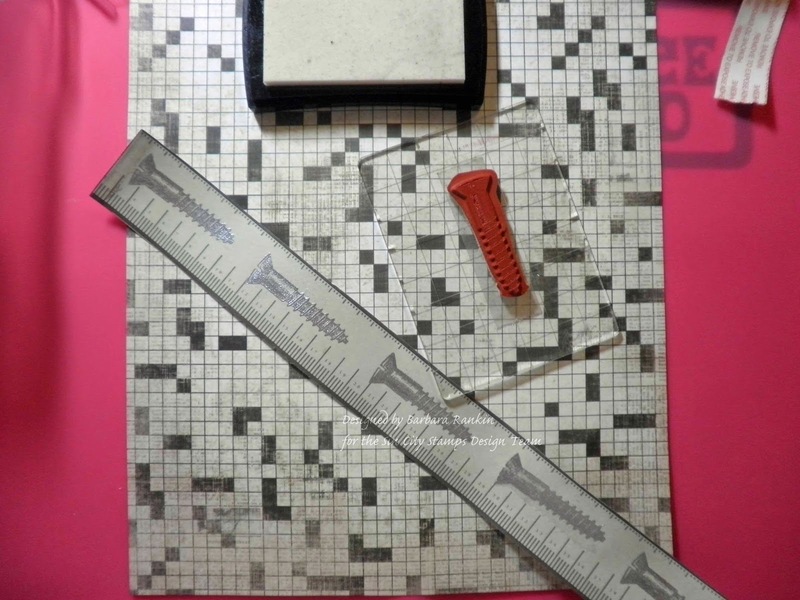 Stamp screw along pre-printed tape measure paper with grey ink, heat emboss with silver embossing powder. Adhere stamped tape measure strip along bottom edge. Die cut a piece of chipboard with Courtyard die. Stamp random images from the Art Journaling with Terri Sproul stamp set with black StazOn ink. Looks like a bit of a mess, but wait. 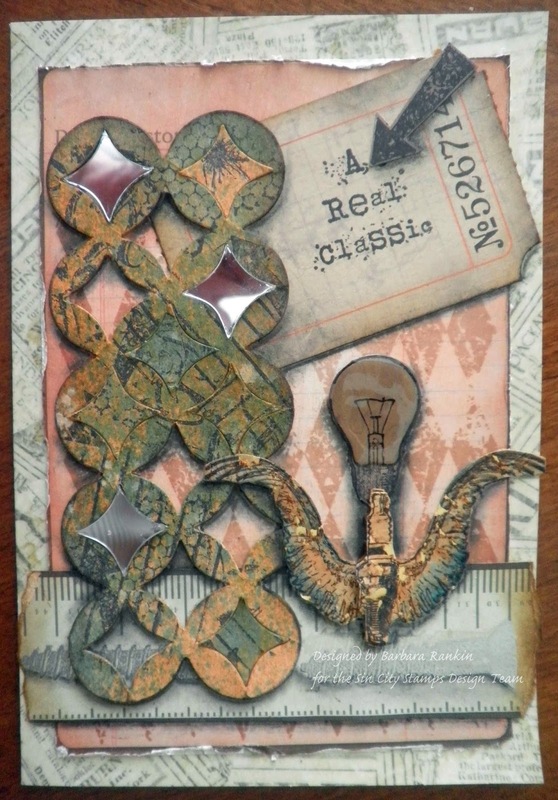 Add colors to the chipboard using Dylusions Squeezed Orange and Calypso Teal spray inks. Spray lightly with White Linen, and again with the orange and teal. Remove die cut from chipboard piece and adhere to card front. I later added some of the center pieces back into the die cut, as well as some of the center pieces I cut from another piece of the mirror card. 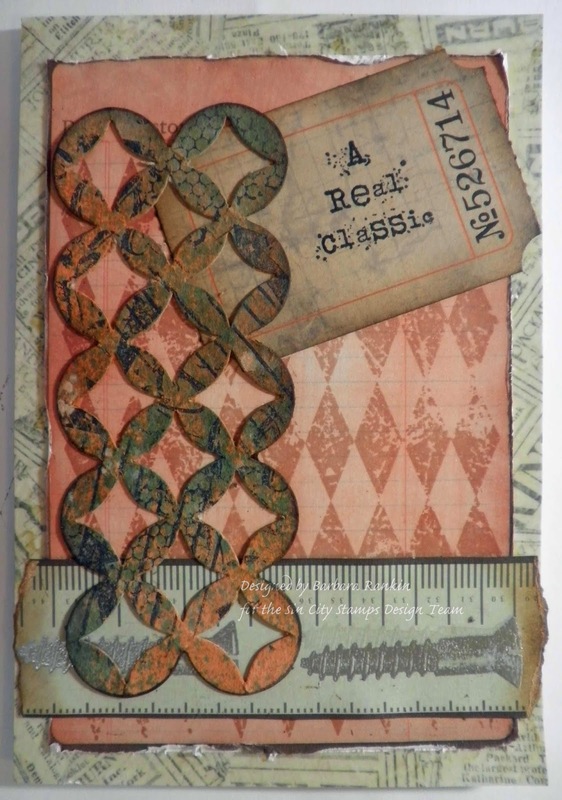 Stamp "A Real Classic" onto a Tim Holtz ticket stub, ink edges with Brushed Corduroy, adhere to card front at an angle. 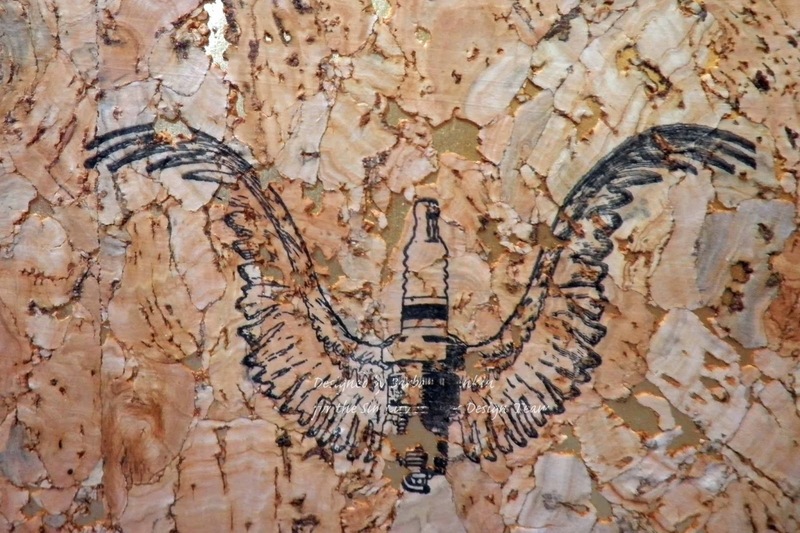 Stamp winged spark plug onto a piece of cork paper. Stamp just the spark plug a second time. Color image with Squeezed Orange on a sponge. Then apply Salty Ocean around the edges of the wings. 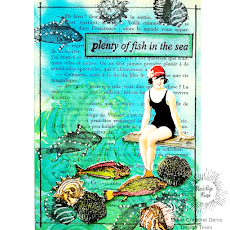 Fussy cut around the image and adhere to card front. Cut out only the spark plug, adhere with pop dots. Stamp light bulb onto scrap of print paper, cut out and adhere to card front beneath spark plug. Add glossy dimension with 3D Crystal Lacquer. Use charcoal pencil and blending stump to give a shadow effect to all of the elements. See finished card photo above. I hope you enjoyed my masculine card project today, and will try making one of your own with these techniques. 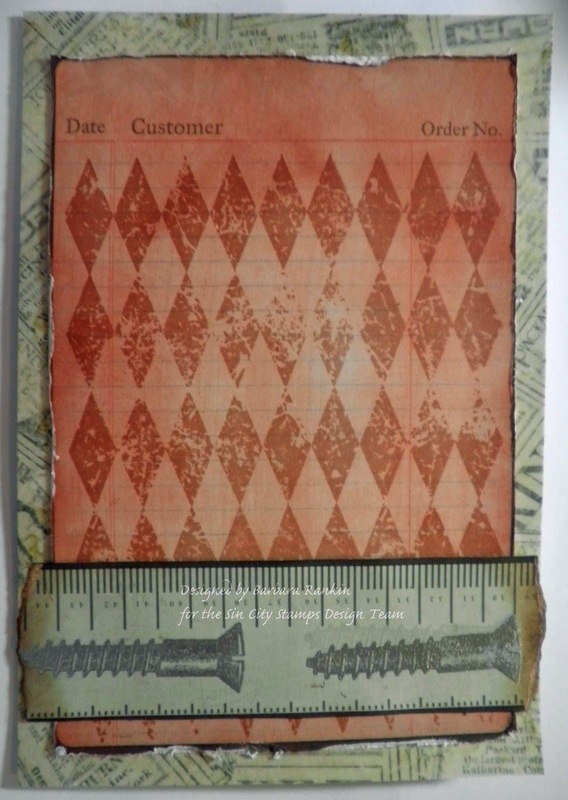 Oh, by the way, have you seen all the new stamps and chipboard available at Sin City Stamps. They are awesome. 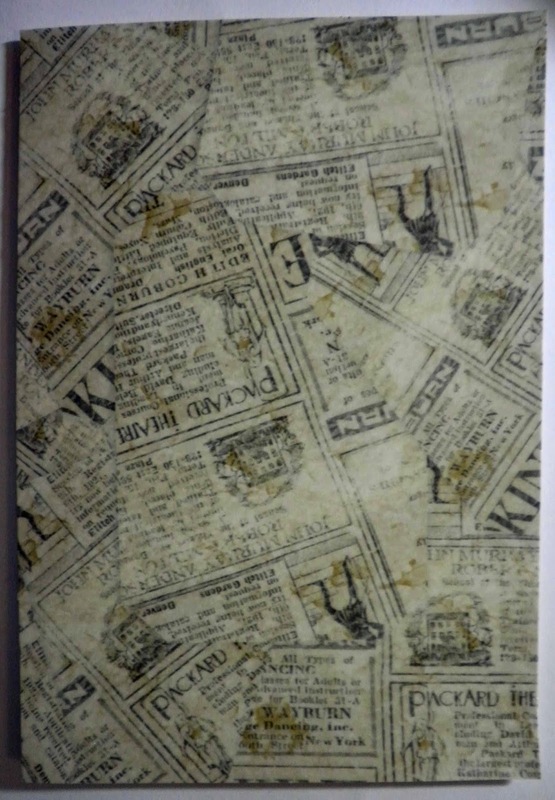 I even have a new Gothic Shrine chipboard piece that will be super fun to alter and decorate. Stay tuned for more on that, because I am going to have a giveaway for one. As always, thanks for stopping by, and be sure to check out the rest of the team's projects this month. This is so awesome Barbara!! 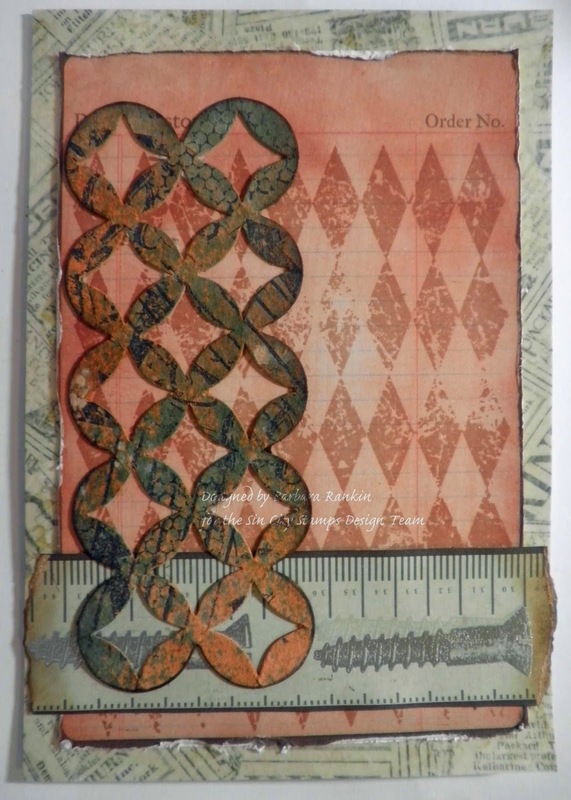 Your work is always so wonderful with the layering you do! Oh it looks great! Very nice tutorial too Barbara. Like it very much, and I know your dad will too! Thanks, Gracie. I hope he likes it. He is 87 and doesn't get steampunk, but he does love my handmade cards. It's so very much a GUY thing. 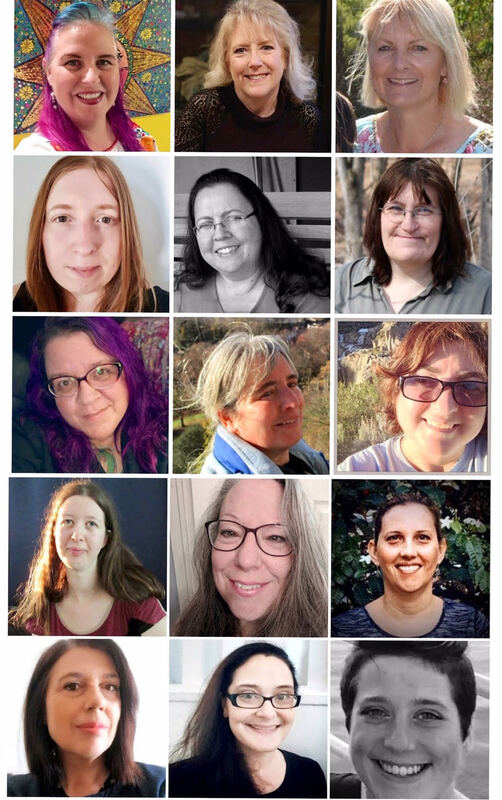 how great is all the colorizing you did. Fantastic job,.